Phylogenetic relationships among 88 genera of Rosaceae were investigated using nucleotide sequence data from six nuclear (18S, gbssi1, gbssi2, ITS, pgip, and ppo) and four chloroplast (matK, ndhF, rbcL, and trnL-trnF) regions, separately and in various combinations, with parsimony and likelihood-based Bayesian approaches. The results were used to examine evolution of non-molecular characters and to develop a new phylogenetically based infrafamilial classification. 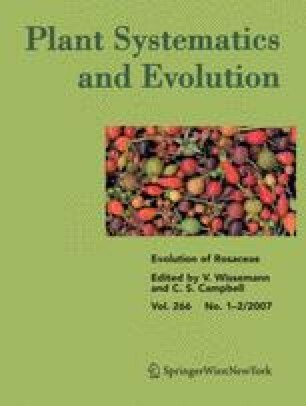 As in previous molecular phylogenetic analyses of the family, we found strong support for monophyly of groups corresponding closely to many previously recognized tribes and subfamilies, but no previous classification was entirely supported, and relationships among the strongly supported clades were weakly resolved and/or conflicted between some data sets. We recognize three subfamilies in Rosaceae: Rosoideae, including Filipendula, Rubus, Rosa, and three tribes; Dryadoideae, comprising the four actinorhizal genera; and Spiraeoideae, comprising Lyonothamnus and seven tribes. All genera previously assigned to Amygdaloideae and Maloideae are included in Spiraeoideae. Three supertribes, one in Rosoideae and two in Spiraeoideae, are recognized. Farr D.F.,Rossman A.Y., Palm M. E.,McCray E. B. (2005) Fungal databases, systematic botany and mycology laboratory. Agricultural Research Service, United States Department of Agriculture, available at http://nt.ars-grin.gov/fungaldatabases/. International Plant Names Index (2006) Published on the internet at http://www.ipni.org. Missouri Botanical Garden (2005) Index to Plant Chromosome Numbers Database, available at http://mobot.mobot.org/W3T/Search/ipcn.html. Nylander J. A. A. (2005) MrAIC, version 1.4., available at http://www.abc.se/~nylander/. Pankhurst R. (2005) Rosaceae database. On-line searchable version available through the International Organization for Plant Information’s Provisional Global Plant Checklist at: http://bgbm3.bgbm.fu-berlin.de/iopi/gpc/query.asp. Rambaut A. (1996) Se-Al: Sequence Alignment Editor. Available at http://evolve.zoo.ox.ac.uk/software.html.